In December, 1917 Father Flanagan opened his first Boys’ Home in a run-down Victorian mansion in downtown Omaha, Nebraska, accepting all boys, regardless of their race or religion. Four years later, in 1921, the operation had grown so large that a move was made to Overlook Farm, outside of Omaha, where it continues today. 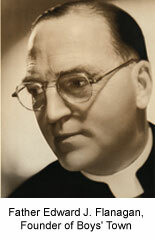 Father Flanagan accepted boys of every race, color and creed. While Boys’ Town continued to grow, it became internationally known with the help of a 1938 movie, “Boys Town,” starring Spencer Tracy and Mickey Rooney. During this same period, Father Flanagan’s Boys’ Town 4-H Club was an active part of the activities. The 1939 National 4-H Club News magazine lists Denny O’Brien as president of the club and also herdsman of 60 Brown Swiss dairy cattle. Teams from Boys’ Town judging or showing beef and dairy cattle often won the competitions at state and county fairs and even at nationally known livestock expositions. Those boys graduating from Boys’ Club during these years, in the yearbook… even the star football and baseball players, often listed that they belonged to the Boys’ Town 4-H Club. 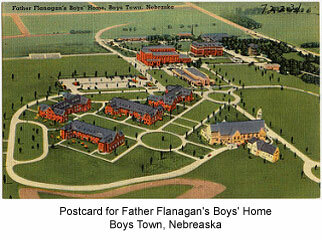 This entry was posted in History and tagged 4-H History, Boys Town, Fr Flanagan by Larry Krug. Bookmark the permalink.